Today was uneventful. I hiked only 3 miles to the RV campground, in my chrap crocs, where I had sent myself a package with new shoes and food. Thank goodness for new shoes. Yesterday’s hike was pretty bad with the heat and wet shoes/socks. I was debating on continuing to hike farther but the in-between toe blisters were still far too sensitive for me to hike on. As you can see in the photo… Warning feet ahead. The blisters have been popped but the pain remains. Imagine a nice big papercut on your finger right at the joints where you constantly bent your finger. That’s exactly how my feet are feeling. I’d rather rest and hike strong than limp my way to Pensacola. I was so happy to throw these nasty shoes. I hate them now. Although I didn’t hike, I did do some chore such as a nice shower (with soap! Yay) and laundry. 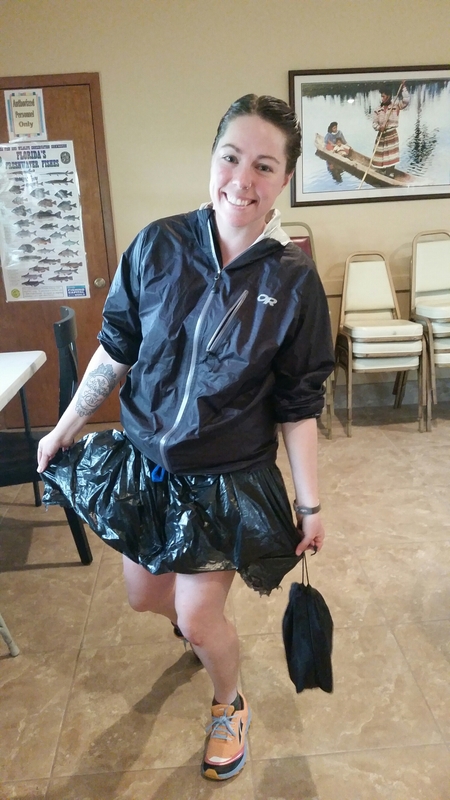 Since the clothed I was wearing needed to be washed, I wore my rain jacket and a skirt made with a garbage bag. I felt like a homeless person and made sure to inform those around me that I wasn’t homeless. A few ladies asked me all sorts of questions and thought it was “brave” of me to hike this trail. I sat in the rec room of the RV park until my clothes were done, no way I was going to walk around the campground in a garbage bag. That gave me enough time to charge my electronics. Once done, I folded my laundry and headed to my camp, with regular pants on of course. At camp, 2 gentlemen were cleaning their fishes and told me that they have already heard of me. They were the husbands of those ladies I had encountered while doing laundry. Wow, the word got around fast. We chit chatted and realized there was a Packers game at 440pm and they told me snack would be provided. Hells yeah! Go Pack Go! 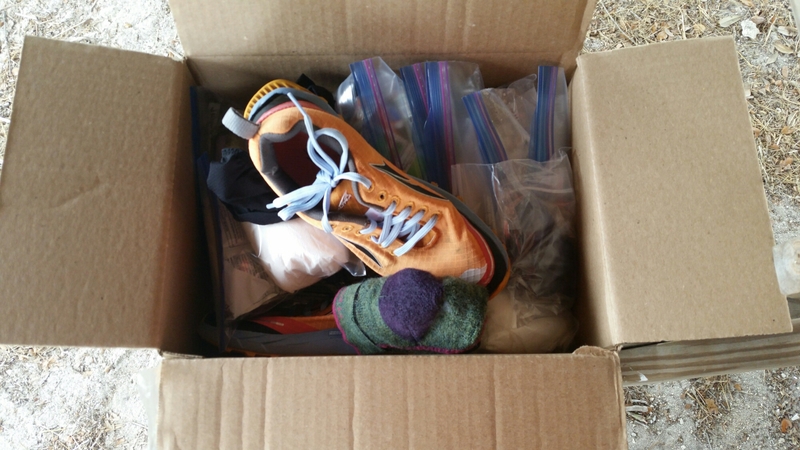 I went back to retrieve a pair of socks i had left on the bench when Alex, a fellow hiker who started with me 3 days prior, arrived into camp. We chatted and he went and jumped in the heated pool and did some chores. The RV campground has a designated site for hikers which is nice and includes a nice big chickee with electricity which was great for charging up. 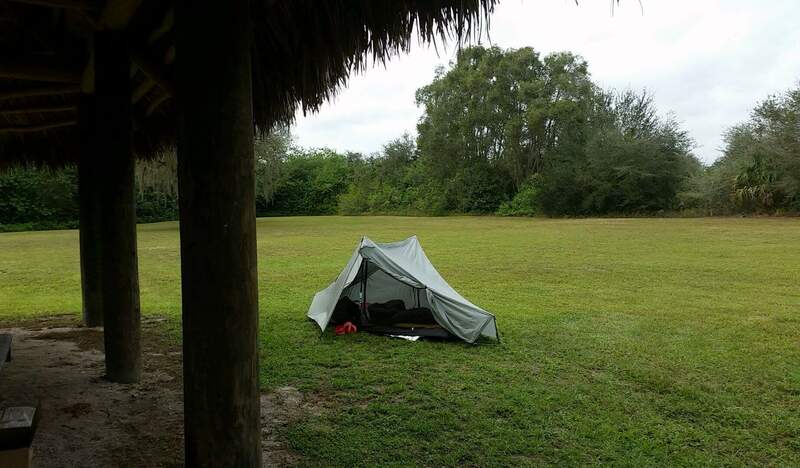 My tent was cramped amongst all the other hikers here tonight as seen below in the photo. Alex joined me later so we’re just the two of us this evening here. So nice and quiet. I went and watched the game with a whole group of folks. One gentleman offered to drive me to the next town, which would save me 45 miles of hiking but that wouldn’t be fun, now would it?! I declined his generous offer. People have been nothing but nice to us, hikers, so far. I’m loving it. 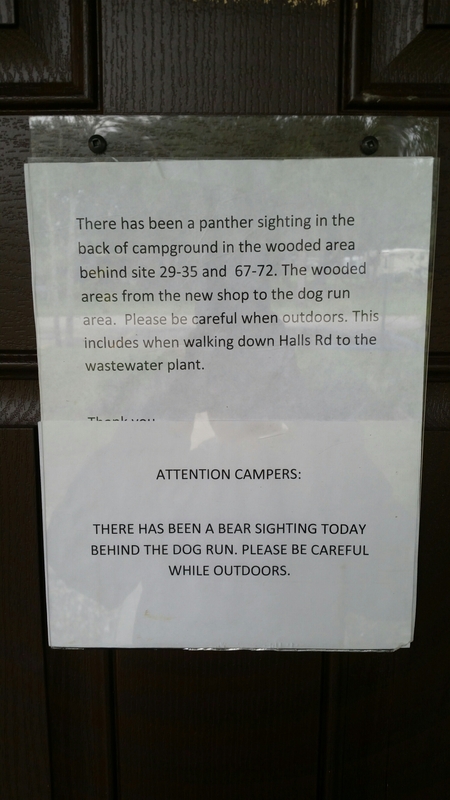 There was a sign warning campers about a panther and a bear sightings in the area behind a section of this small campground. And while watching the game another woman came in mentioning that her friend had saw a panther again today. Hopefully we will get to see one from afar someday. That’s basically it for today, the Packers won and I showered. Good day indeed. Happy trails. 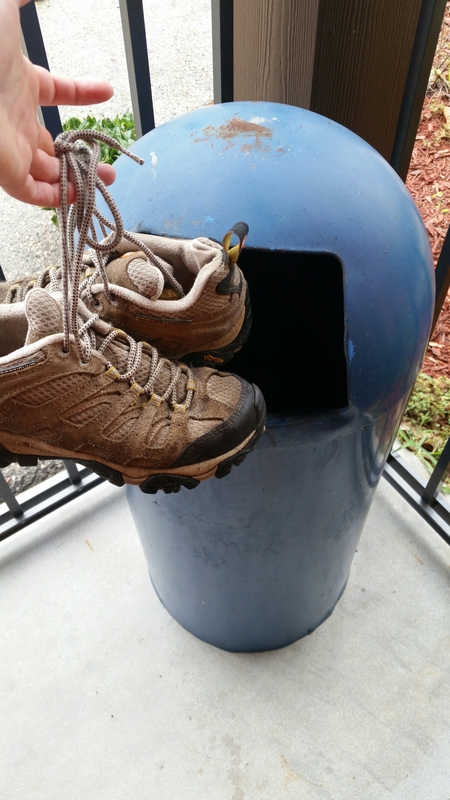 You should have sent your shoes home instead of throwing them out. Mine are nailed to two trees in the yard for birds to nest in. Take care of those feet. You are doing great. Thanks Tom! Trying to take care of them. That one blister is bothering me something fierce but I’m hiking along. Made 20miles on it. It can’t be that bad. RIP to Melanie’s Merrells 😦 I’ve had two pairs of those and I always get blisters with anything over about 4 miles. They used to be fine. I’ve done Isle royale with them and most death march… I guess my feet wanted altras instead. I love them.